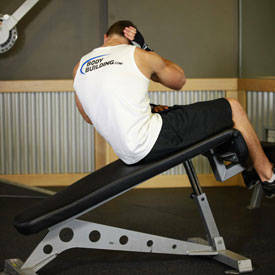 Secure your legs at the end of the decline bench and slowly lay down on the bench. Raise your upper body off the bench until your torso is about 35-45 degrees if measured from the floor. Put one hand beside your head and the other on your thigh. This will be your starting position. Raise your upper body slowly from the starting position while turning your torso to the left. Continue crunching up as you exhale until your right elbow touches your left knee. Hold this contracted position for a second. Tip: Focus on keeping your abs tight and keeping the movement slow and controlled. Lower your body back down slowly to the starting position as you inhale. After completing one set on the right for the recommended amount of repetitions, switch to your left side. Tip: Focus on really twisting your torso and feeling the contraction when you are in the up position. Variations: You can perform this exercise on a flat surface or you can also alternate from side to side in each repetition.